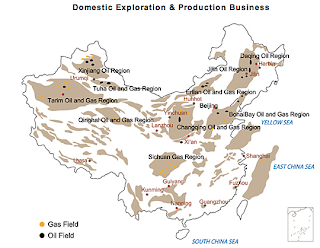 If one looks at a map of China, at first it seems to be a land that has been heavily endowed with gas and oil fields. However, with the continued rise in demand for liquid fuel, exploration and development are being aggressively pursued inside the nation, as well as offshore and abroad. Current levels of production, and those planned, still leave an increasing volume that must be imported each year to meet the national demand. And yet, as has been noted earlier, while demand has continued to soar, overall domestic production has not changed all that much. 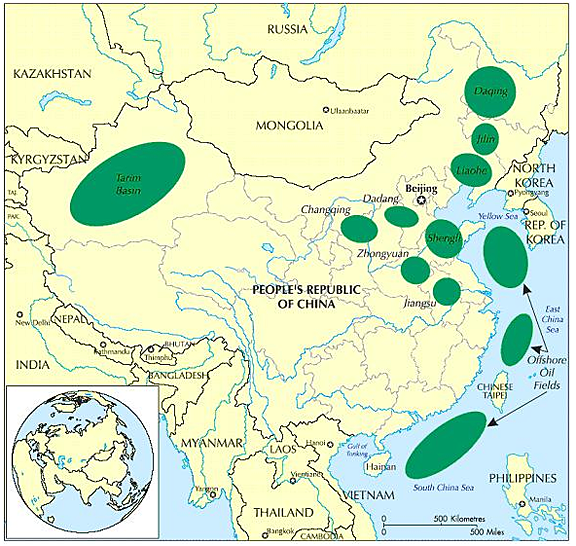 China has three major oil production companies, PetroChina, Sinopec and CNOOC, where the last of these, the Chinese National Offshore Oil Company (discussed in an earlier post) deals – as the name suggests – with offshore deposits, and the other two are concerned with onshore production. 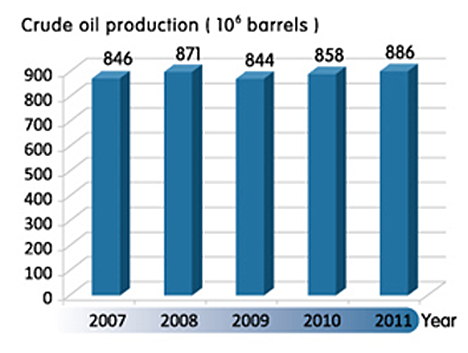 According to the 2012 BP Statistical Review China produced an average of 4.09 mbd in 2011, which was a 0.3% increase over that produced in 2010. As mentioned in the earlier post, CNOOC is only able to project a sustained production level this year because of the increasing production from its overseas properties in Canada and Iraq. In the first half of this year they produced some 127 million barrels of oil, close enough to 700 kbd in total, and similar to last year’s average. Within the country the industry is split between two companies, the China National Petroleum Corporation (CNPC), which has PetroChina as its publically traded division, has some 60% of the oil production and 80% of the natural gas production. Just this year PetroChina was recognized as having passed ExxonMobil to become the largest listed oil producer in the world. With overall production of 2.43 mbd it exceeded the ExxonMobil total of 2.3 mbd in January. (Although it is suggested that PetroChina made only half the profit of its competitor). One has also to distinguish between the production that the company is able to achieve in China, relative to that which it achieves through its acquisitions abroad. The company shows a domestic record of production that has averaged 2.42 mbd in 2011 with slight rises in production for the past two. For the first half of this year the company has refined an average of 2.69 mbd which was expensive for the company given that the sales price for the resulting products are controlled in China. Additional production, to the tune of 343 kbd, comes from their foreign holdings. By 2020 the company intends that this amount (almost 10% of output) will be increased to 50% of the company production. Assuming that it can sustain domestic levels of production this anticipates that it will need to be able to find roughly 1.4 mbd of additional production from sites abroad. PetroChina, runs, inter alia, the largest field in China, that at Daqing. After the discovery of commercial oil at Songji No. 3 well in September 1959, the field was brought into production over three years. The field was where “Iron Man” Wang Xinji gained national fame through his efforts as an oil driller with the 1205 Drilling Team to bring in the first production well. 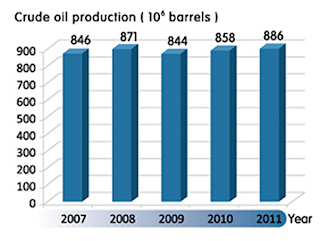 Production at the field peaked in 1976 at roughly 1 mbd with more than 14 billion barrels of oil now having been produced. Oil recovery is cited at 50%, a rate that is about 10-15% higher that the average in Chinese reservoirs. Just this week the company completed an addition to the refinery there that raises capacity to 197 kbd at that refinery of Daqing Petrochemical. Production at the field itself has now fallen, in overall average for 2011, to roughly 790 kbd, and relies on tertiary recovery using a polymer based flood in a field which has an over 80% water cut. The company believes that more than 70% of the recoverable oil now has been. Next door to Daqing lies the Jilin Oil Province, containing some 21 oil fields. Of these the Fuyu field was first discovered with the well Fu-27 in September 1959, with full exploration in 1961 though it was not developed to full potential until 1970. 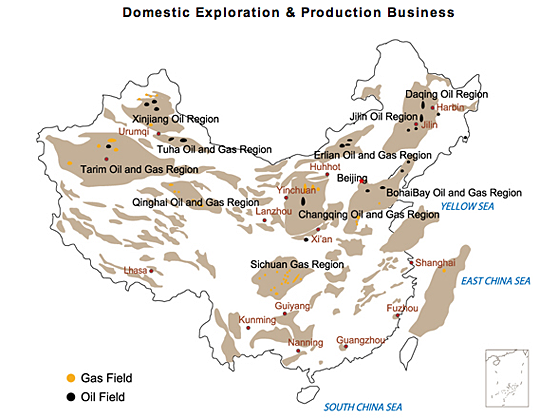 CNPC, PetroChina’s parent, runs the Province, which is the seventh largest in China. Last year it produced some 148 kbdoe and this is to be raised to roughly 200 kbd by 2015. CNPC also began production in Iraq this past year, and anticipates some 59 kbd from that source. The Changqing Oil Field is also operated by CNPC. Discovered in 1971 it reached a total of 800 kbdoe in 2011 with a year-on-year growth in production of some 7 million barrels. Far out West in China lies the Tarim Oil Field, which has been set a goal of producing sensibly 1 mbdoe by 2020, though more recent announcements have lowered that target by 20%. Operated by PetroChina, achieving that target will move it toward the front of the fields in the country, from its current fourth place. It has a reserve estimated at 100 billion barrels of oil equivalent, and is the largest natural gas producer in China. Shengli (Sinopec) Shengli field, which is, at around 557 kbd production in 2010 is currently the second largest producing field in China. Sinopec anticipate that by 2020 it will produce more than half of its oil and gas from abroad and by 2015 expects that it will be close to that goal. China Petrochemical, Sinopec’s parent, seeks to produce 50 million metric tons of crude a year overseas by 2015. Last year, foreign production was 22.9 million tons. Sinopec said it boosted first-half crude output 4.3 percent to 163.09 million barrels and overseas production jumped 82 percent to 11.13 million barrels. If Sinopec sustains domestic production at some 895 kbd through 2020, then it will need to find nearly 1 mbd of overseas production to match that in just 3 years. In short, while China is working as hard as it can to sustain current levels of production into the future, in order to meet the growth that they anticipate they will be looking to buy (combining all three company goals) close to 2.5 mbd from overseas deposits. The big question of course remains as to where that production will come from, and, if we are at a world plateau in overall production, at whose expense will that supply need be met. P.S. On a continuing note, it is worth remarking that the Alyeska pipeline flowed at an average volume of 430,967 bd in July.